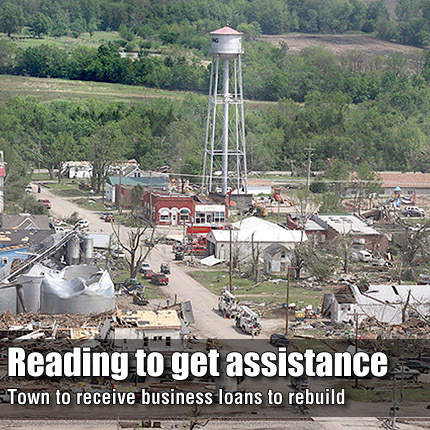 The Kansas Division of Emergency Management has received notice that the state was granted a declaration for Small Business Administration loan assistance for Reading, in the aftermath of the May 21 tornado. SBA provides low interest disaster loans to homeowners, renters, businesses of all sizes and private, nonprofit organizations to repair or replace real estate, personal property, machinery and equipment, inventory and business assets that have been damaged or destroyed in a declared disaster. Residents and business owners were able to apply for assistance beginning June 1, at Reading Elementary School, 424 First St., Reading. Assistance will be available 8 a.m. to 4:30 p.m. Monday through Friday through June 16. The Kansas Division of Emergency Management Response and Recovery branch in Topeka will continue to monitor the situation and provide assistance and support, as needed. The state incident management team turned operations over to Lyon County and Reading officials May 26. The regional emergency management coordinator from the Kansas Division of Emergency Management will continue to assist local authorities with any requests the state might need to fulfill. Demolition of tornado-damaged homes deemed uninhabitable in Reading began May 26. Families seeking housing may contact Kansas Housing Resources Corporation at (785) 296-0081 for information on rental units available statewide. Most units affiliated with KHRC do require individuals to meet income guidelines. People seeking housing may also call (877) 428-8844. Monetary donations can be made to the United Ways of Kansas Tornado Relief Fund and sent to 245 North Water, Wichita, KS 67201. Please write “Reading KS” in the memo line. One hundred percent of all donations will be sent to disaster victims in Reading. For more information, contact the United Way by calling 2-1-1. Material items are also in need. Donations may be taken directly to the south side of the Reading school. Of particular need are large tarps, plywood, roofing nails, plastic tub containers, flashlights and batteries, hand cleaner, paper towels, toilet paper and personal hygiene items, trash bags, first aid items, including pain relievers and adhesive bandages, and nonperishable food items. Cleanup is ongoing in Reading and volunteers may assist with those efforts. Volunteers should check in at the school or fire department to notify officials of their presence in town and availability. Anyone wanting to volunteer or donate items for Reading tornado victims should call the Reading Elementary School at (620) 699-3827 from 9 a.m. to 4 p.m. The American Red Cross shelter was closed Wednesday because no one was using it. Electric power has been restored through most of the town and the boil water advisory has been lifted. The Kansas Department of Revenue is waiving fees for persons needing to replace identification and documents lost in the Reading or other recent storm. Anyone who has lost a driver’s license may go to a full service driver’s license office and prove they lived at an address in any storm-affected area by showing a utility bill, school document or other mail that lists their address. The department will then replace their license free of charge. Lost vehicle titles may be replaced free of charge by going to their local county treasurer’s office. Anyone who lost a vehicle in the storm may bring their insurance claim to the local county treasurer’s office and apply for a refund for the vehicle’s tags. Lost tax returns may be replaced by calling (785) 368-8222. Storm victims who need to replace lost birth and marriage certificates should contact the Office of Vital Statistics, in Topeka. An executive order signed by Secretary Robert Moser is in effect, allowing for a waiver of replacement fees for victims of the May 21 tornado in Reading. The Kansas State Animal Response Team reported that five cats and one dog have been rescued in Reading and are still unclaimed at this time. The animals were taken to the Emporia Animal Shelter, 1216 Hatcher St., Emporia. Photographs of the animals have been posted in the Reading supply distribution area inside the school. Call (620) 481-4028 for information about the pets. INK, located at Gibson Pharmacy, 521 Market, Osage City, will be selling T-shirts to benefit the victims of the May 21 Reading tornado. All proceeds from the sale of the shirts until June 3 will be donated to the Salvation Army for Reading relief. For more information, call Nicole Majors at (785) 633-9764.